On a number line, we’d show that all the possible answers are on the positive side (right) of 7 by highlight that part of the number line. We’d also put an empty circle around 7 because it’s not included (< or > mean number isn’t included, so empty circle). On the other hand, if the number was included (≤, ≥) that means we’d put a solid dot, or solid circle, around the number. To extend our understanding of inequalities, we are going to combine our knowledge of quadratic functions to inequalities. So, when you are given a quadratic inequality, the first step is to factor it so you can find the zeros (or x-intercepts.) The next step would be to show this on a sign chart, so you would first draw 1 number line and put your two zeros on there. Now, you would focus on your first zero. You would draw a negative sign (-) on the left of the number, and a positive sign (+) on the right of it in both sections. Draw another number line and you would do the same for the second zero, draw a negative sign above all the sections on the left of the zero and positive sign to the side on the right. Next, you would draw a third and final number line. Draw both of the zeros on the number line first. Now, look at the two number lines you previously drew. You will multiply the signs in the first section, for example, if there is a negative sign in the far right side for both number lines, then multiply those by each other to get a positive. Then drop that sign onto the third number line in the same section. In section 2, you would do the same. Multiply the signs by each other and drop the sign you get onto the third number line (e.g. + x – = -). Do this again for the third section. Now, depending on the inequality sign, this number line will help you find your answer. If the sign in the inequality is 0> or 0≥, then you are looking for the negative sections on the third number line. 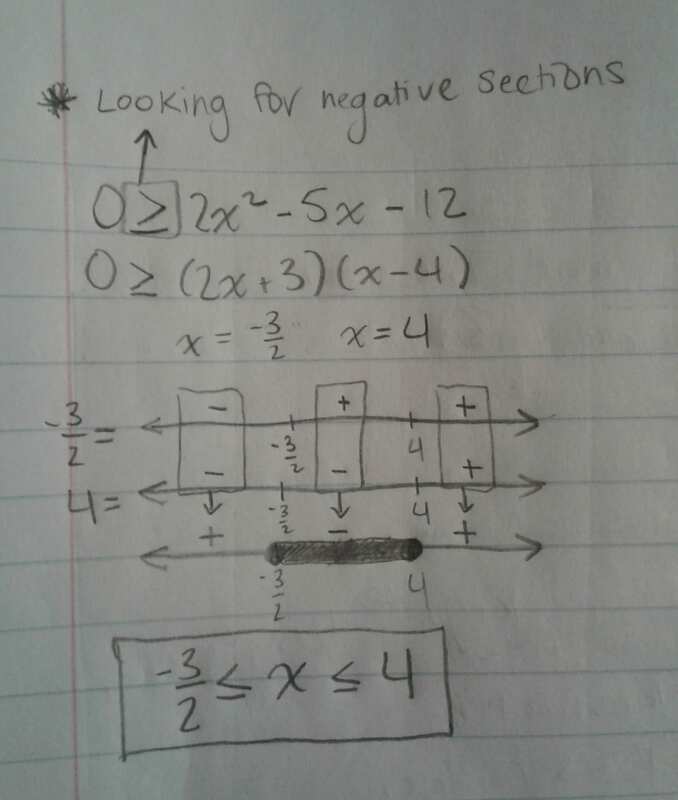 If the sign is 0< or 0≤, then you would be looking for the positive sections. Using this information, you can find the inequality sign to use between x and the different factors and whether you can have it as one inequality or more than one. I’ve included an example below that you can use to follow along with the instructions.